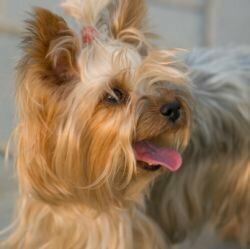 The Yorkshire Terrier Dog Breed, or Yorkies, originated from Scotland but bred in England. They were molded to hunt rats, but nowadays they are popular as pets. In fact, their variety was one of the Top Dog Breeds of 2005. They usually grow being small and light varieties. Hence, owners do not mind having their pets on their lap almost all day. Moreover, this usual bonding activity usually transforms this lap dog into a bright, playful, and loyal companion pet. - Urolithiasis, an infection of the urinary tract leading to the formation of bladder stones. - They require daily grooming. - Ears and eyes must be cleaned and checked regularly. - Dental hygiene must be regularly maintained. - They are fit only for short strides. - They should have a regular play time while lying under the sunbeams, chasing shadows, and joining tug-of-war. In the 19th century, a number of weavers from Scotland migrated to England and brought with them different terriers that were bred to hunt rats. Through time, these terriers were crossed and terriers with "broken hairs" were produced. In 1870, a "broken-haired Scotch terrier" was named as a Yorkshire terrier by a reporter. He argued that the breed should be called as such because his types were bred in a town called Yorkshire. Though the Yorkies were originally bred as working dogs, they became fashionable pets is England in the latter part of the Victorian era. 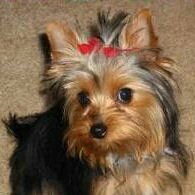 In 1972, Yorkies were brought to the United States and became the country's favorite pet. 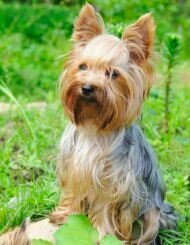 You can say that the Yorkies developed into tough breeds because of their ancestors' reputation as rat-hunters. However, their size, and playful and bright character have actually captured the attention and affection of most pet owners. Most proud owners would boast that they have the great giants inside the bodies of these little dogs. If you want a small but terrible breed of dog, grab a Yorkie now! Just a friendly reminder, they would really need your attention and companionship than any other terriers.